…you know I’m gonna be, I’m gonna be the one who drinks up next to you! Cos I will drink 500 beers, and I will drink 500 more! 2015 is a big year for me beer-wise… I’ve taken on the challenge of drinking 500 different beers, whilst at the same time as staying healthy – not an impossibility when you consider it’s full of good ingredients! I’m already 150 beers in and it’s not yet Easter. The challenge is not so much drinking 500 beers, but more that I have to travel far and wide to find 500 different beers – there just aren’t that many on offer in Norfolk (UK). This week, I find myself in B.C. 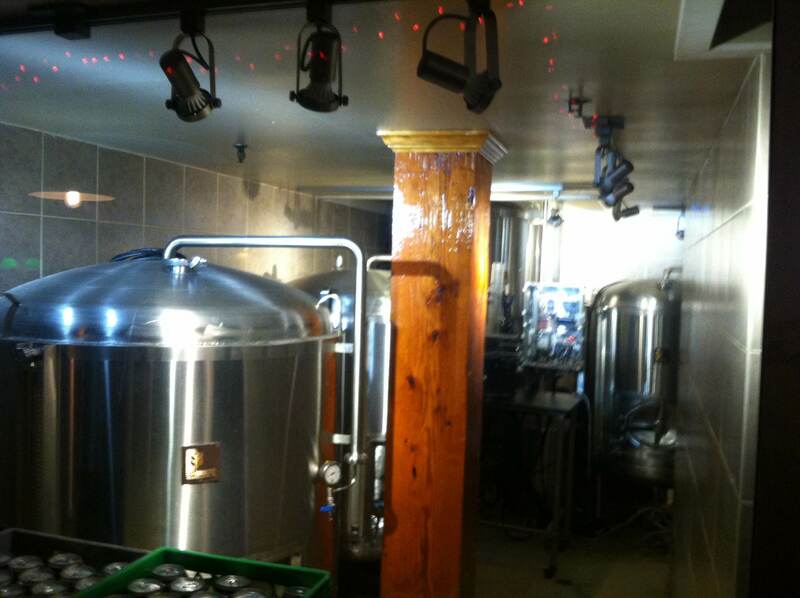 (British Columbia) in Pat’s Pub, 403 East Hastings St, Vancouver http://www.patspub.ca/brew/&#8230; I found it when I googled ‘craft beers Vancouver’. BC this evening could equally mean “before comedy” as I’ve stumbled across the weekly stand-ups (on stage, not the usual wise cracks at the bar). The bar tender is extremely friendly (& trendy), & she takes the trouble to actually write down the names of the beers on my paddle – the manager is mega enthusiastic, who informs me there’s some 94 local brewers, immediately telling me that he’s going to give me some free samples, including an Irish number that people have swapped from Guinness for (that’s no accolade, but I’ll give it a try). 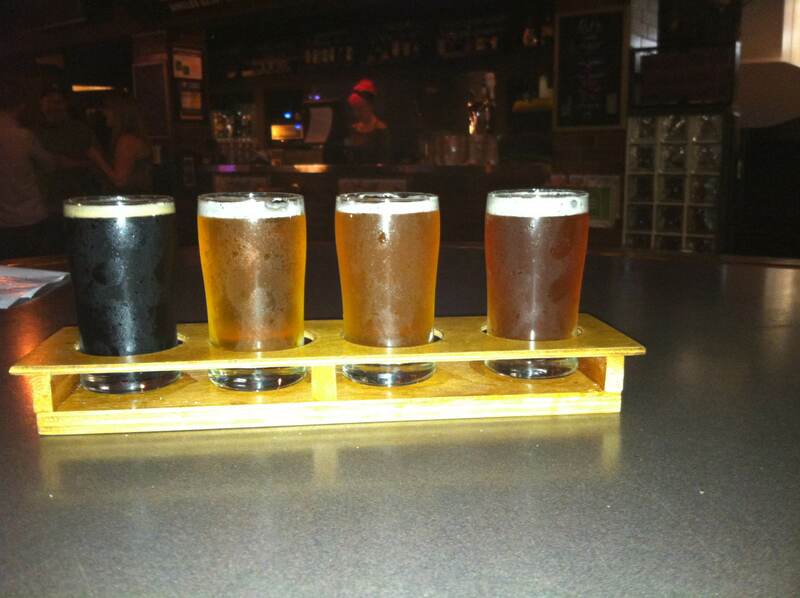 The first beer (from right to left) is their special – once it’s gone, it’s gone – Snowblind Belgian IPA.. an amber-looking, mild grapefruit starter, that is made with good ol’ Aussie and New Zealand hops (as so much of the world’s beer now is, by the way). I imagine this one will be gone very soon. Its neighbour is Fat Tug IPA – being the West Coast, you have to expect an abundance of IPAs – more grapefruit, but perhaps too strong at 7% to take as an aperitif. New Zealand features in the next sample too – Motueka, a town on the South Island that grows hops ideal for pilsners… Four Winds Pilsner raises the bar for the rest that follow here: it’s fabulous (& I’m not a pilsner fan, per se), bitter, hoppy, and complimentary to the other citrus starters with a tangerine freshness. No. 4 is Sasquatch Stout – sasquatch = ‘bigfoot’ from this region, so I better be careful on my way home, given it’s 5%… it’s actually a nice coffee mild, which goes well with the excellent local delicacy beer sandwich that you dip into a gravy soup (very messy, finger-licking good)! What’s interesting about Pat’s Pub is that they have their own brewery, yet a distinct lack of their own beer is noticeable – it’s a good educational facility though, and judging from the sasquatch’n down-&-out gauntlet I had to run through to get here, I’m sure they get in the local schools for beer tasting sessions to start them early. If they don’t, they should. Pubs definitely need to provide entertainment. Comedy tonight. Last night it was beermat frisbee golf… from your position at the bar, you try to lob a beermat into a jug some 10-15 feet away, 30-odd times, against an opponent or 3, and the loser buys the winner, er, a beer. Tremendous excitement, but costly for the uninitiated like myself. Next time you’re in Seattle, tell Anthony I sent you – he’s the landlord at the Pioneer Square Saloon on Yesler Street, a local pub in another down-&-out area… boy, do I choose them! Finally, I regret that I have not had time to post on BOTF for a few months, and there’s been so much to say. For those of you who’ve missed me, go drown your sorrows on a couple of strong IPAs… you might like to try some of the ones above. In the meantime, I’ll try to keep you posted (so to speak) more regularly with B.C. (beer comedy).